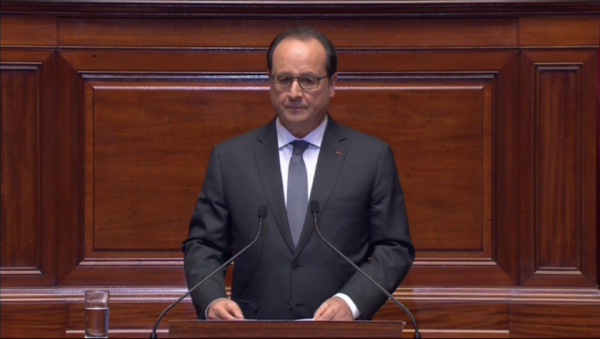 Speaking during a joint session of both houses of parliament President Francois Hollande has said that France is committed to “destroying” ISIS after last week’s deadly attacks. Francois Holland said he would table a bill to extend the state of emergency declared after the attacks for three months and would suggest changes to the constitution. France’s military campaign against ISIS in Iraq and Syria will also intensify. ISIS says it carried out the attacks on bars, restaurants, the Bataclan concert hall and Stade de France in which 129 people died. Francois Hollande said the constitution needed to be amended as “we need an appropriate tool we can use without having to resort to the state of emergency”. He said he would travel to meet Presidents Barack Obama and Vladimir Putin in the coming days to discuss action against the group. US Secretary of State John Kerry arrived in Paris on November 16 to show support for “America’s oldest friend” against what he called “psychopathic monsters”. At a G20 summit in Turkey, world leaders promised tighter co-operation in the wake of the attacks. Barack Obama said the US and France had made a new agreement on intelligence sharing but said US military advisers thought sending ground troops to combat ISIS would be a mistake. In his address, Francois Hollande reiterated his opposition to Syrian President Bashar al-Assad remaining in power but said “our enemy in Syria is Daesh [ISIS]”. He promised more resources for the security forces and said the Charles de Gaulle aircraft carrier would be sent on November 19 to bolster the military campaign against ISIS. On November 15, French aircraft attacked Raqqa, ISIS stronghold in Syria. French officials said 10 jets had dropped 20 guided bombs targeting sites including a command centre, a recruitment centre for jihadists, a munitions depot and a training camp. ISIS has issued a statement saying the raid targeted empty locations and that there were no casualties.